An automobile with 0.260 m radius tires travels 80,000 km before wearing them out. How many revolutions do the tires make, neglecting any backing up and any change in radius due to wear? This is College Physics Answers with Shaun Dychko. The distance these tires cover which is eighty thousand kilometers, is the arc length along the perimeter of the tire. 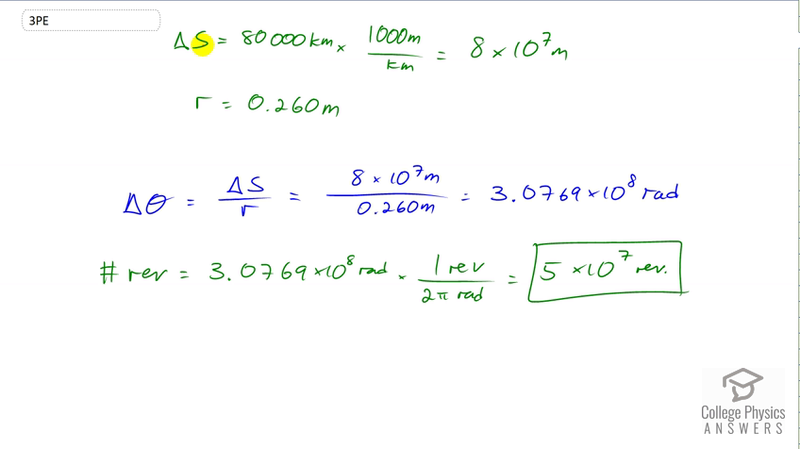 So I call it delta s and that's converted into meters by multiplying by 1000 meters per kilometer. It's eight times ten to the seven meters. We keep only one significant figure here because it's not really clear how many significant figures we should have so I guess we can assume it's one. The radius of the tire is 0.260 meters and we know that the angle over which it rotates is the arc length divided by the tire's radius. So that's eight times ten to the seven meters divided by 0.260 meters which gives us 3.0769 times ten to the eight radians. Now the question asks us for the number of rotations of the tire. So, there is one rotation or revolution in every two pi radians and so this is a conversion factor we can use to convert from radians into revolutions. So that's 3.0769 times ten to the eight radians multiplied by one revolution for every two pi radians. The radians cancel leaving us with units of revolutions and that is five times ten to the seven revolutions.